I admit that this is probably the type of thing you make for your first child and then don't have time to make for the rest of them, but I wanted to share the scrapbook I made for R's first three months! Maybe this will inspire you to make something like this for your kids too. 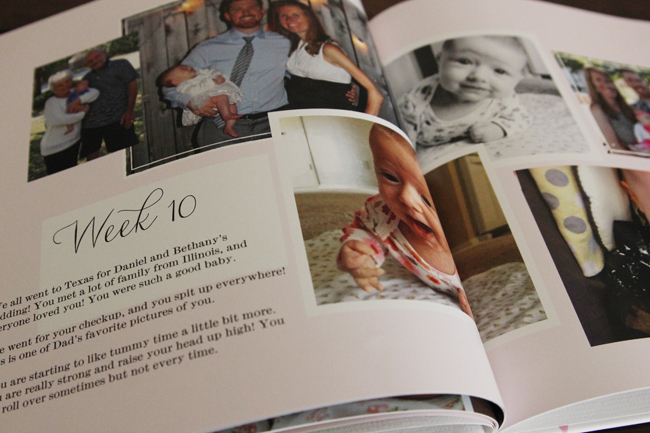 Now that she's almost six months old, I already treasure having a book of her beginning weeks filled with pictures of her as a tiny newborn and am glad I took the time to put this together. 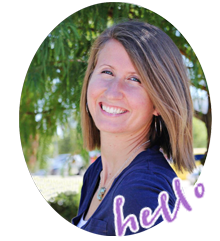 If you've been around this blog for any length of time or know me in real life, you know how much I love to document life through picture taking and scrapbook making. It's easy to take pictures and have them fill up the memory on your phone or computer but never actually see the light of day, and one of my favorite things to do is print photos to use in scrapbooks or to hang on the wall. My original idea with this book was to make a page for each week of R's first year, covering all 52 weeks. You're probably laughing at me right now, which you should because that idea is ridiculous. I soon realized that keeping up with this project was fairly time consuming, so I shortened it to just the first three months. 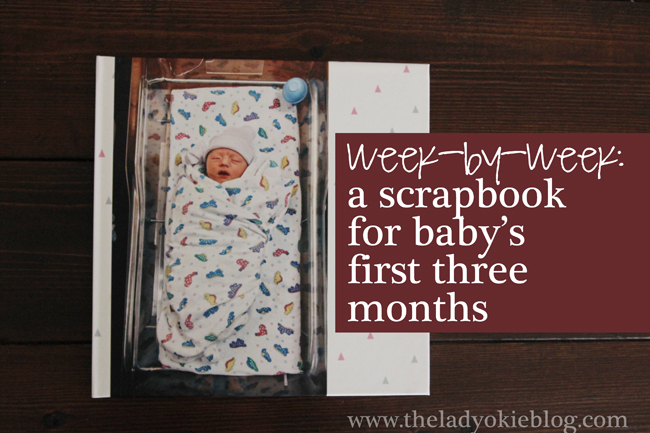 A lot of people make baby scrapbooks by month, but I liked the idea of narrowing it more and making pages for each week, sharing photos and writing down the little things we did and milestones she reached. I think the key to a book like this is to keep up with it as it happens. While going back and making a book by month is feasible, it would be really hard to retroactively make a weekly book unless you've kept good notes and have time to sift through a bunch of pictures. Each two-page spread in this book is one week of her life. I took so many photos of R in the beginning (and still now, let's be honest), and I love that I have two pages devoted to just those photos. For each week I also included a bulleted list of "things I want to remember." Sometimes it was an observation of R's milestones (like rolling over), and other times it was to document a trip or a visitor or a "first" like our first walk in the stroller or our first time to attend church. It's so fun to look back and see all the things we did in those first few weeks! I obviously didn't include every single photo I took during that week. I tried to choose my favorites and the ones that told a story or was something I wanted to remember. Each page has a different layout so it looks unique all the way through. 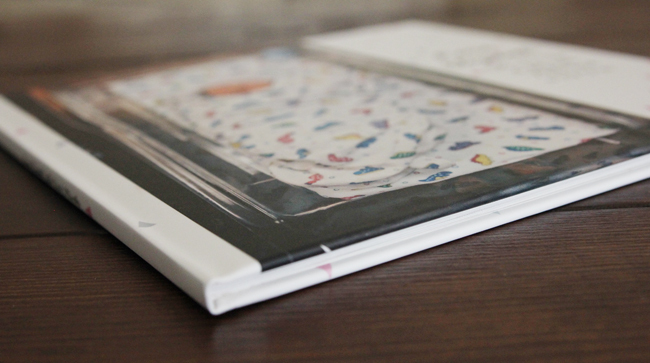 In case you're wondering, this book is a 10x10 size made from Shutterfly. I upgraded to a matte cover (instead of glossy, which it comes with). For the most part, I tried to put together the week's spread on the last day of the week. I did get behind a few times but by no more than one week, because otherwise it would have been too hard for me to keep the weeks separate. I would upload the photos I took, edit them, write down that week's memorable moments, and put together the two-page layout. I would say on average it took at least one hour a week, up to two if I had a lot of photos to sort through and edit. By the end, I was happy to be done because it was hard to keep up with. 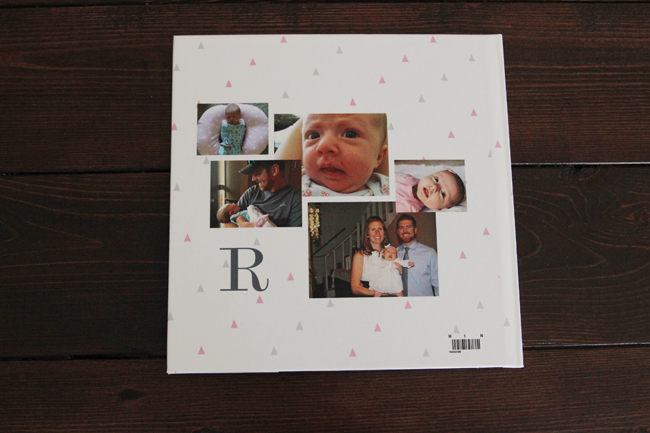 But now I have this lovely book of R's first three months, so it was definitely worth it! Questions or feedback? Leave a comment! 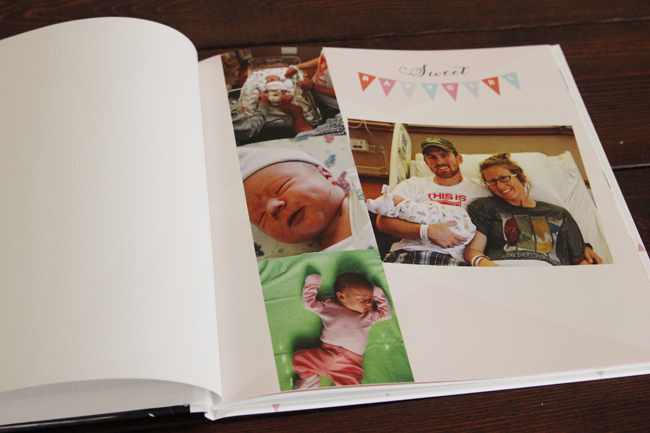 Do you print photos or make scrapbooks? How do you document (or plan on documenting) your child's year? I can't believe you had time for this! 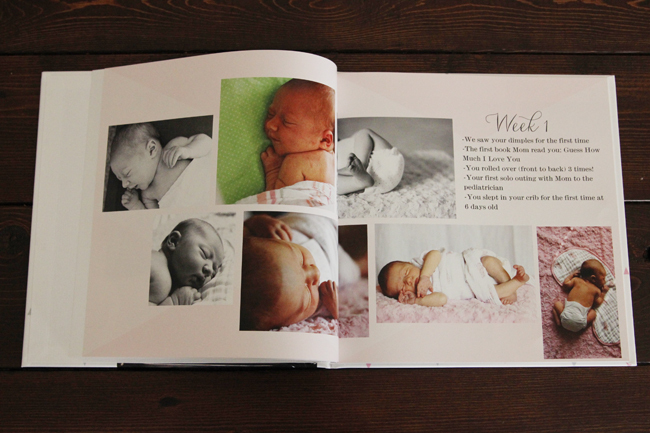 :) What a beautiful book that your daughter will treasure. For now I write down little notables on our "baby wellness" sheets, which we've continued to use, and I take lots of pictures . . . that I'm totally behind in editing. I think you're right that the key is to keep up "as it happens" rather than attempt to catch up. I love this! I want to do something similar, but life right now is just about surviving on zero sleep and soaking up newborn snuggles. BUT I found this app called "Day One" that lets you put in pictures with notes and it sorts them by the dates the pictures were taken. I know I'll be glad I have that when I finally sit down to make something like this! SO.VERY.COOL! I love love love this! I try to make a note each day of something he does...and sometimes it's as little as "NO NAPS!" haha. My notes have definitely made it easier to update his baby book...but I absolutely love your idea of documenting the early weeks. Nice work, Mama! This is going to be such a precious keepsake to have! And by going to be I mean I'm sure it already IS! This is adorable! Emily has a traditional baby book, which admittedly I have been bad about keeping up with at this point. It has pages for birthdays up to 5, first day of school, first time to the dentist (? ), and some other firsts. I was really good the first two years or so and then it's sort of gone to the back burner. Love it! 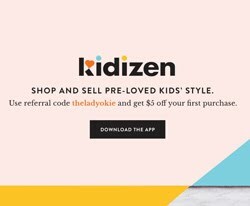 Did you know that Project Life has an app for iPhone!?! It has changed my scrapbooking life!!! I did this for the first 2 years of my twin nieces life :) I love looking back through the books. 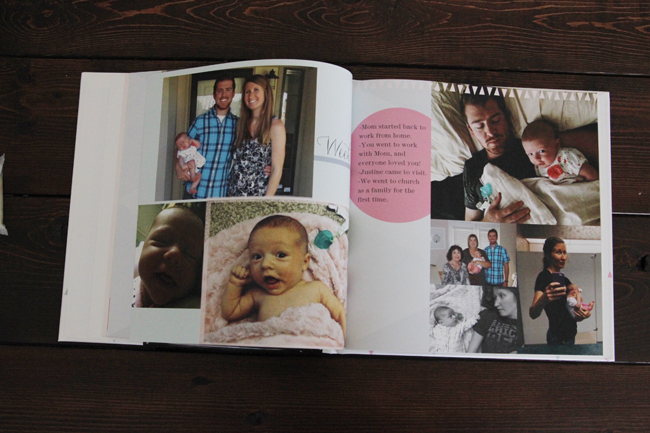 Shutterfly's books are amazing! So sweet! 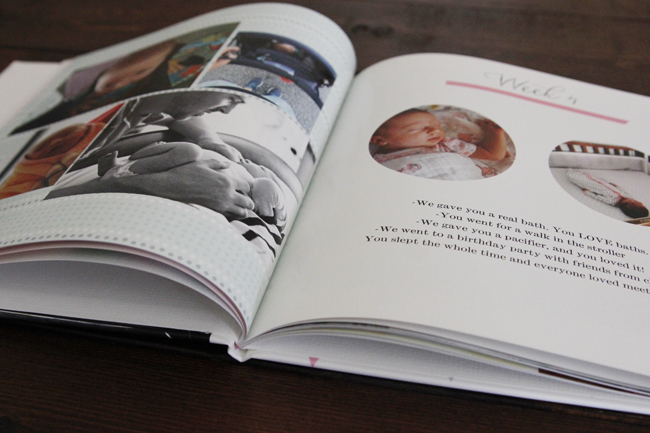 I am so impressed, I think I have the first 3 months of Charlie's baby book done. (Safe to say, it fell to the wayside once I returned from maternity leave). I'm fortunate that I recorded some of his stats on my blog though, so I at least have that to look back on and reference whenever I do decide to catch up! R is going to love looking at this memory book when she is older. What a precious keepsake. She will love it when she's old enough to look through it! What a great idea! This is something that you will all love looking at forever! I did something very similar for Aiden and I'm so glad I did. You forget so much so quickly, even if you swear you never will. ;) I also used one of Lucy Darling's Simple Book of Firsts for the rest of his first year. It's simple and sweet. Good job Mama. Love the photos you captured! i absolutely love this. i think they change so much in the beginning... well, okay, all the time really, that it would be nice to look back on this. what a wonderful keepsake. You are awesome! 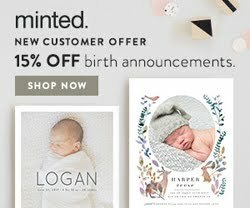 I have no idea how you managed hormones, a new baby and scrapbooking!!! I'm glad you have it though and it will be really neat to have over the years. Wow, this is beautiful! I wish my kids had something like that to remember. I started an old-school scrapbook for my first few (that was 11 years ago before I think digital scrapbooking was even a thing) and now I guess I need to continue it, although I'm woefully behind on ALL of them. I figure once everyone is at school I'll have time to catch up and it can be a graduation present for each child as they leave the house. 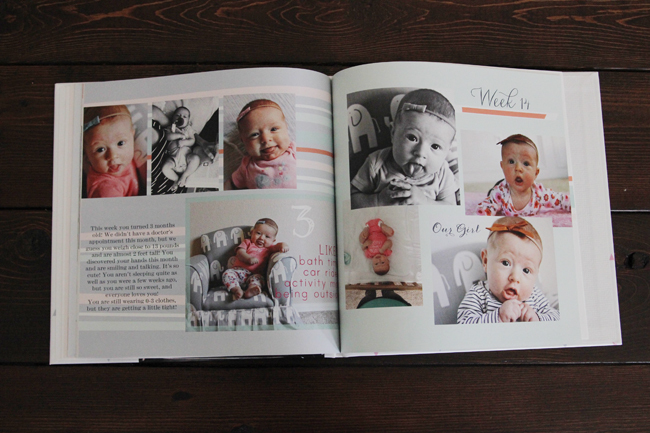 I document the first year in detail: their milestones, the vacations we took, etc and then I just have a 2-page spread with photos for each year of their life after that. It's just that first year that is hard, and after that it's not bad. What an adorable book! I did a separate Shutterfly book (cause I had a coupon) for the baby's first year (milestones mostly), Project Life style for the majority of family life, and a few artifact uprising (my fav) for vacations/trips. Have a discount code to use now if I can get myself in gear to print some for the end of 2015/beginning of 2016. I go in spurts and wish I could keep a more steady course!